As I work in Bonn, I sometimes represent Germany, for example in the World Meteorological Organisation or in EU science projects. A colleague once noted that I am fond of making clear that while I represent Germany, I am actually Dutch. Could be, at least I like the slogan "I did not start the war". The Second World War. It is a truism, but Germans are not allowed to say so. So, I say it on their behalf. In addition Germans are still treated as if they are personally responsible. So, it is more pleasant if people know that I am not German. My father traveled from The Netherlands to Austria on his motorbike. Admittedly long ago, not too long after the war, when he was young. At the border between France and Germany the customs were not willing to speak German, until they saw his Dutch passport, then they were suddenly able to speak German fluently. Before I moved to Germany in 2000 I told a few friends that it was nice that the hostile feelings against Germans were over. They each time looked at me like I was from another planet. They were right. I must have had a sheltered life with nice friends. More recently I went to Dublin for a week of fun at the European Meteorological Society meeting and stayed at a bed and breakfast. As far as I can see I got the worst room. The landlord asked a few times whether I was German. Maybe because the answer, "No, I am Dutch", was too much of a shock to process in one step. The toilet was next to my pillow, a naked light bulb, the backside of the water basin was unfinished lumber. The other rooms looked better and were not all occupied during the week. When reserving a room a normally ask for a firm mattress, maybe I should add: "I did not start the war". It made no sense to me when my first German language teacher said she felt personally responsible for the war. She was born well after the war. But if people treat you like you are guilty, it is easy to start feeling guilty. We are social animals after all. In a survey published today one in ten Germans agreed with the thesis: "Even if I did not do anything bad myself, I feel guilty for the Holocaust". This shows the power of social contagion, when the way Germans are treated by others can make 10% believe something that is impossible. How much larger will this effect be in cases were it is hard to judge who is right, the person or many others. If people treat you badly because of the way you look, it is too easy to say you should just ignore that. It will leave its trace. Ironically racists often call for an end to the shame and blame culture, while their counterparts in other countries produce it. While they are technically right that it is not logical to feel guilty, what they actually want is that people do not know what the consequences of their ideology of hate and conflict are. Fortunately in the same survey 79% say it is important to teach history in school. The two main reasons for this are to learn about the damages caused by racism (79%) and to prevent a return of national socialism (84%). More than half reported to have victims of the Second World War in their families. Not mentioned in the survey, but the independent public media are also very important. They feature German history regularly and show emotional interviews of victims of the Nazi regime. The most important lesson of such interviews may be that the Nazis did not start with the Holocaust, they started with parades, denigration, discrimination and deportation. It ended with the Holocaust. In complete different German news today: The federal government is thinking about free public transport, starting with experiments in Bonn & four other cities, to reduce private transport & fight air pollution. They revealed these plans in a letter to the EU on how they will keep air pollution below the limits they themselves agreed to. 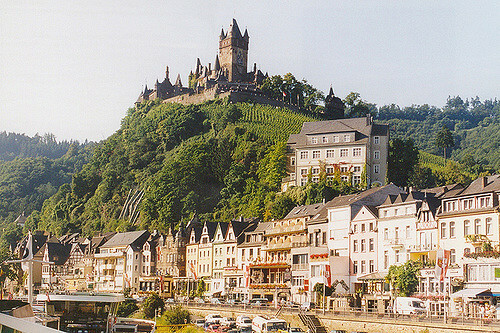 * Top photo Cochem with Reichsburg shot by Roger W, used under a Creative Commons Attribution-ShareAlike 2.0 Generic (CC BY-SA 2.0) license. I live in a society surrounded by people who choose to live high carbon lifestyles. They are starting the next war. Sorry about your experience in Dublin. In most of Ireland we enjoy having German visitors, and I think you were just unlucky. Yes, I expect that I was unlucky. Every country has a few percent a*holes (who think they are the silent majority). Unfortunately, a few percent can create an unpleasant world. The Germans say that my home country, The Netherlands, is one of the worst, as measured by the frequency that their car mirrors are destroyed. We have loads of German tourists here in the west country. They come because of English crime books by I think rosamund pitcher, there are endless German series of them on their tv featuring the glorious Cornish scenery and coast with the English people speaking perfect German. Bizarre. I would say the Dutch and Scandinavians are our favourite people's. . Surprised about your irish experience. Firstly, did you use bookimg.com so you could have checked out your accommodation? It is a real pity the Germans synchronize their TV programs from abroad. You miss so much in the translation and if it is subtitled you automatically learn the language. I am really bad at languages, but my English is somewhat okay because of Dutch TV subtitles (not because of school, otherwise my French would have been better). As student I hiked in Cornwell. Really beautiful. And we were really lucky only rain on the first few days and the last few days. We met some other tourists who before us had had three weeks of continuous rain and had given up on their hiking plans and toured the region by car. Once you know the problems of the room, you can also see how the photos were skilfully framed not to show them. And the photos were from all rooms, not the specific one I got. I am sure the guy was an outlier, but a few bad apples are enough to change the atmosphere. Plus it is always possible it was an accident. In the time I went to the gym regularly, women much more often accidentally touched or bumped. For every individual case it was easy to see it as an accident, but the statistics were reasonably clear. Unfortunately they are always dubbed. At least it helps to know what happened and how dangerous tribalism is. It should not lead to guilt, given that people living now did not do anything. When I am in England I am always impressed by the huge place the military side of WWII takes up in book stores.